The Wake Survivors reunion was held in Boise, Idaho, last weekend, September 9-10, 2016, and a good time was had by all. Leroy Myers was the only survivor in attendance this year, but sixty family members and friends gathered to honor him and remember those who were not with us. Alice Ingham once again organized a wonderful weekend with hospitality room and evening banquet. Alice and her family have made the decision that next year will be the last reunion and the memorabilia collection will be donated to the Idaho State Historical Society. It’s a good time to look back at the history of the group. 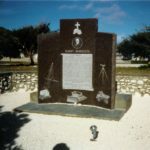 When WWII ended in 1945, about 900 civilian contractors captured on Wake Island were liberated from Japanese POW camps. Two hundred and fifty never made it home, having died in battle or as POWs. Most of our ex-POWs returned home suffering illnesses, injuries, disabilities, and what we now call PTSD. While military ex-POWs had the organized support systems of their services, the civilian survivors were just turned loose. 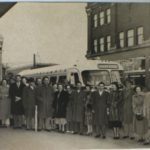 Thanks to home front efforts of those who had kept in touch with the families, several hundred survivors were able to gather in Boise in December 1945 to celebrate their freedom and begin to fight for their rights. 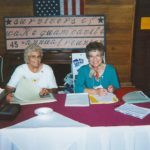 The postwar Wake survivors’ organization owed a great deal to the Women of Wake, a group of LA-area wives and mothers that formed in early 1942 when faced with the news of capture and the abrupt cessation of paychecks. Led by Mary Ward, they enlisted the aid of political and union leaders to pressure Washington for compensation legislation. The Women of Wake met regularly during the war for mutual support, to share information, and to continue the fight. Meanwhile, lobbyists from the contractors and others also worked to secure legislation to compensate the captured workers and provide for their dependents. Pacific Island Employees Foundation, a wartime charity created by the contracting companies including Morrison-Knudsen, provided much-needed financial aid and issued monthly bulletins with vital information. With access to employment records, they were able to reach nearly all of the families. The PIEF produced the “Blue Book” in 1945, detailing relief efforts and legislation achieved, and containing prewar photos of many of the men. 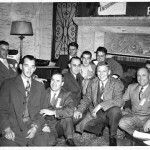 When that group of liberated POWs met in Boise for their first national convention Dec 7-9, 1945, there were many unknowns: the full extent of deaths, how war claims would be handled, where hundreds of their fellows had disappeared to, what disabilities they would have to live with, and if they had any hope of pressing lawsuits. These issues and more formed the agenda for the Workers of Wake, Guam, and Cavite in the coming years. Mary Ward, the ex-Women of Wake president, served as president of the new organization for the next thirteen years, making frequent trips to Washington DC to lobby on their behalf. The membership met often to pursue federal credits, disability coverage, and benefits on the basis of their wartime internment. The 1948 War Claims Act and other legislation provided additional compensation and a tort bill increased coverage for cruel treatment and starvation during their POW years. The members debated extension of these hard-won benefits to non-dues-paying members and argued over Mary Ward’s role. 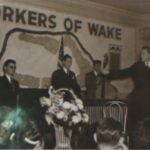 With deep division and declining membership, the Workers of Wake disbanded in 1958. Sadly, another eighty of the young Wake workers had died during these years, most from the effects of wartime imprisonment. 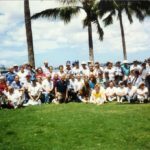 The group reorganized as the “Survivors of Wake, Guam, and Cavite” in 1959, committed to unity and purpose. Clarifying membership rights and responsibilities, the survivors elected officers and regained strength quickly. A newsletter called “The Little Wig Wag” went out to hundreds of mailboxes across the nation. 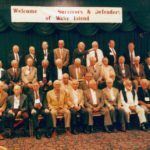 Regional chapters held meetings and annual national conventions were held in various cities: gala affairs with well-attended business meetings and themed dinner-dances. The survivors continued to fight for disability coverage and veterans’ status, gathered and shared information, and met in supportive groups to share their POW experiences. In 1985, a number of the Wake survivors, both military and civilian, seized the opportunity to return to Wake Island on a charter flight. On the island the civilians were keenly aware that there was nothing to mark their role in the war or honor their dead, so they vowed to work toward a permanent memorial. Three years later they returned with wives and families to dedicate the large granite memorial that stands on Wake today, facing the sea. A second memorial stands near the “POW Rock,” dedicated to the 98 who were massacred on Wake in 1943. 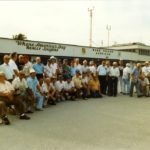 As the survivors passed from middle age into their retirement years, they continued to meet, working together, socializing, and marking the passage of their fellows. Many gave interviews and wrote memoirs. Books, articles, films, and news programs produced in the last several decades have spread their story far and wide. Increasingly, the adult children and relatives of survivors and the deceased joined the group to learn more and share their families’ stories. In 2003 the Survivors of Wake, Guam, and Cavite voted to dissolve and donated its records to the Idaho State Historical Society. 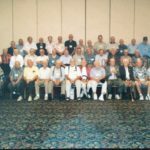 At that time, Alice Ingham, widow of survivor Ralph “Pete” Ingham, volunteered to maintain the newsletter, as well as organize the reunions, luncheons and coffees in Boise. She has done a remarkable job since 2004 and we will be forever grateful. The final reunion will be held next year on September 8-9, 2017, in Boise. Although it marks the end of an era, it will not end the strong bonds that tie our Wake Family together. Thank- you Bonnie! I appreciate every one of your posts! I found my dad, Harvey Savitz, in the 2003 Boise picture. Very precious!